However which way we look at it, driving out costs from business operations still dominates the directives of C-Suites across the Global 2000 - just revisit our 2014 study to see how little has changed. Fast forward to today, and the only real differences, since then, are the methods to slake this thirst for cost elimination, as traditional operating models are no longer delivering much more than incremental value. Our new State of Operations and Outsourcing Study, conducted with KPMG, covers the dynamics of 381 operations leaders from the Global 2000 and reveals these rapidly changing C-Suite directives to drive out their number one nemesis: cost. The perennial issue here is clearly one where C-Suites rarely feel exhilarated by the cost reduction impact of their operations leaders. 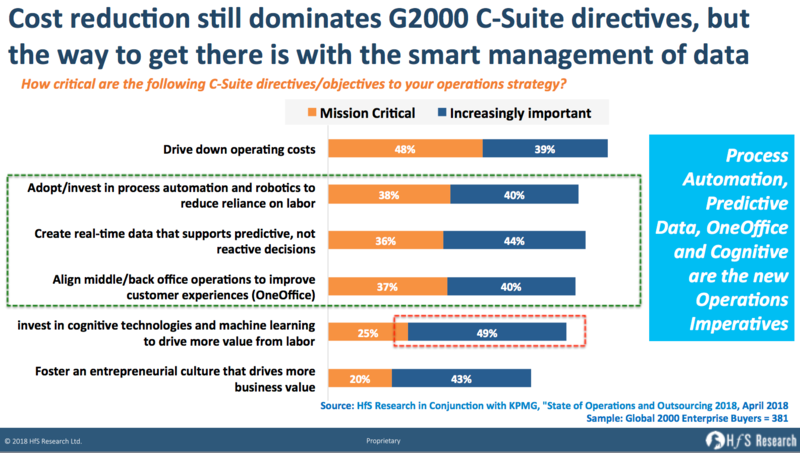 Of all their mission-critical directives this year (see above), none disappoints them as much as their ability to impact cost reduction (only 28% are very satisfied), while there are much larger numbers of C-Suite leaders already a lot happier with their robotic process investments (40% 'very satisfied' and a further 30% 'satisfied'). 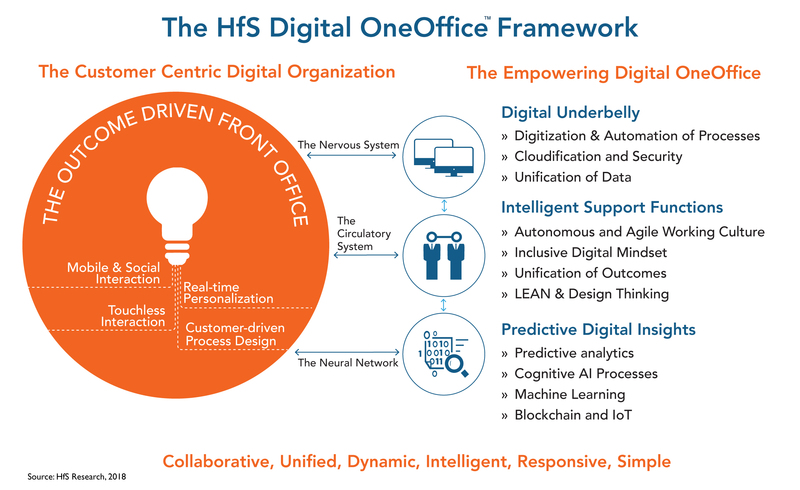 However, as we continue to see this strong impact in these areas aligned to robotics, OneOffice, and predictive analytics, surely it's merely a test of time until we see these initiatives having greater visibility, in terms of ironing out unnecessary costs and inefficiencies in the system. Ever since my first blog 11 years ago (right here), we've pretty much repeated the same conversation that's been continually refined over the years. The only game changers have been the gradual need for less people to run operations as cloud-based software platforms take-hold, offshore talent is optimized, and the more recent introduction of robotic process automation solutions to remove manual workarounds and create broader digital processes, that can be aligned with common business outcomes and metrics. However, these changes are more fundamental than merely slimming down the number of cooks in the kitchen and making the food taste better: it's forcing a complete rethink from ambitious firms to redesign operating frameworks where revamped business processes are enabling true digital business models, where emerging AI capabilities can be weaved in... where innovation is native to the culture of the firm and its people. Yes, it's redesigning the entire kitchen, not merely hiring some better chefs with better recipes. Just as many enterprises were running out of places to find more and more hidden costs they could quickly remedy through (yet) more outsourcing, along came their perfect new toy to unearth costs they had never thought possible to eliminate: RPA. Yes, folks, this stuff is just the thing to keep you occupied for the next few years to keep your greedy CFOs at bay - and even includes the word "robot" to conjure up images of human work displacement, creating hours upon hours of repetitive (robotic) debate at conferences from people who literally sprung from seemingly nowhere to become lifelong experts in this new dark art. And, oddly, most of these new RPA maestros seem to be exactly the same people who were hawking the delights of outsourcing just a couple of years ago. Maybe the connection between outsourcing and RPA is a lot closer than we think? 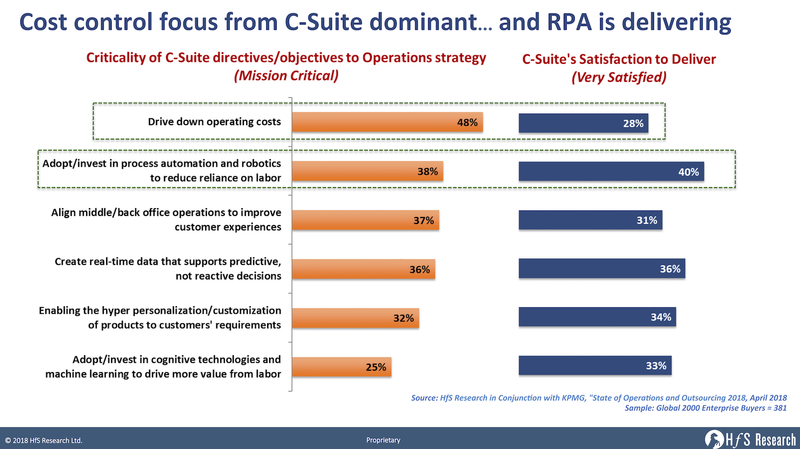 So let's have a gander at the new findings from the 2018 State of Operations and Outsourcing study, conducted with KPMG across 381 Global 2000 organizations, where we questioned operations leaders about their intentions to keep investing in RPA and outsourcing.